I first came into contact with the work of Claus Ogermann when he produced and accompanied Barbra Streisand on her 1970s vintage Classical Barbra album - still worth a listen I might add (very much agreed - Ed.). Born in Ratibor in what is now part of Poland, Ogermann’s influences as a composer include Scriabin and Reger, and jazz plays an important part in his thinking as well. No less a giant than Bill Evans has recorded his music. He seems to be one of those composers that although recognized, has not gained nor seemingly sought the limelight. 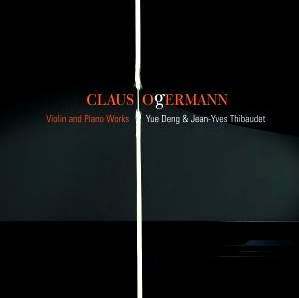 This disc of works for violin and piano was a pleasant surprise, and a welcome re-acquaintance with a composer that I respected as a child, if even through a single recording. Originally a work for violin and orchestra, the Sarabande-Fantasie adheres somewhat to the dance-form popular in Handel’s day, but also allows the soloist to rhapsodise as the composer tells it, through passages of the score. The predominant mood of the music is that of a distant melancholy, somewhat akin to the ethos of Copland’s Quiet City. Not necessarily dissonant, the work is more atmospheric than tuneful. One walks away with less memory of the melody and more of an impression of the mood it sets. The Duo Lirico takes a similar tack. Romantic in its rather sweeping melodic gestures, this is music that evokes the images of long walks home, rainy nights and inward, reflective thinking. Although rife with deep feelings, one could not readily say that it is passionate. It is instead Brahmsian in its introspection. There is no question about its jazz influence, and one cannot escape the image of the bar about to close and the solitary last patron sitting alone in the dark in dread of what waits at home. The Preludio and Chant begins with much more energy than the preceding works moving along with a driving sixteenth note underpinning from the piano. But it isn’t long before we are back at the late night bar with another long and spun out melody, lovely in its darkness but beginning to sound an awful lot like the earlier works. The program concludes with Nightwings a worked soaked in jazz improvisation and originally composed as an encore piece à la Fritz Kreisler, albeit much less light-hearted than the bonbons of the late Viennese master. This piece, in spite of its similarity to the larger works on the program, actually comes off better because of its brevity and its close stylistic relationship to the jazz standards of the early part of the twentieth century. Ms. Deng is a friend to this music, blending a lovely and warm tone with Ella Fitzgerald’s sensitivity to the subtleties of moods and melodies. She has ample virtuoso technique, but you are never hammered with it. She brings off the music with disarming ease, never lacking in commitment. Boy-wonder turned mature artist Jean-Yves Thibaudet is completely in his element. He is a real partner to Ms. Deng, never overshadowing the solo lines, but at the same time adding his own abundantly colorful tone and deep understanding of nuance and shading to the mixture. One wonders how often Mr. Thibaudet can be found after-hours in some small jazz club mixing it up with the cats in the band. This is not necessarily a disc to take in a single sitting. Each of these four works has merit individually, but the sameness of mood and style can get a bit oppressive taken as a whole recital. If you sample them one at a time with a chance to breathe between them, however, you will find music of great merit.